Every day thousands of cats are transported by trucks from many cities in China such as Nanjing, Shanghai, Jiashan, Suzhou, Anhui, Hunan, Hubei, Heibei, to eventually reach a hellish destination called Guangzhou. In small wooden cages that do not even allow them to stretch their bodies, the stressed, fearful and desperate cats are on a journey with only one outcome - a horrible death. When they reach Guangzhou, these cats are sold to local markets and restaurants within the city, and then ultimately butchered (horrifically) to be eaten. The cats are stressed purposely because the evil people who eat them believe by stressing the poor animal chemicals are released which supposedly improves the flavor of the flesh. The cats are shown absolutely no mercy or respect, they suffer unimaginably from beginning to end. Cages holding the cats are tossed from trucks onto the pavement causing terrible injuries and suffering. Cats are intelligent and highly sensitive souls and will suffer enormously, both physically and mentally. This mass slaughter has been happening for many years but, to the shame of the people of Guangzhou, has reached a peak in recent years. I am very sorry to inform you of this depressing story. However, these are the facts of what is happening here in my city, which claims to be the most civilized and developed city in southern China, and which will host the 2010 Asian Sports Games. In Shanghai and many other cities where the cats come from, many people are trying to stop the stealing and shipping of cats. They are the animals right advocates and cat carers who have lost their beloved cats. Many people used to feed the cats in their houses or their local areas, but they have found that cats in their area have been disappearing rapidly. Actually the cats are stolen by evil people and shipped to the province of Guangdong where they end their lives miserably and leave their dear owners heart-broken. These evil catnappers take advantage of an absence of any law to protect animals and operate without fear of prosecution. They pay petty thieves to steel cats in their neighbourhoods. The thieves usually use a trap with a bird on top of it to attract cats. Once the cat enters the trap out of curiosity, it can't escape. Recently some determined, caring people have joined together to establish a team, that is Shanghai Cats' Protection Team. They are fighting against the criminals on their own due to the lack of legislation for animal protection. They have won several fantastic battles on Aug. 05, Aug. 14, Aug. 16 and Aug 19, Sep 21 and Nov.2 ( please see our reports for more details). We are so proud of these brave fighters, who, out of their compassion and love for our lovely animal friends, rush to the highway and daringly stop the trucks physically over and over again. They are fighting extremely hard battles, sacrificing their own time, comfort and personal safety, even risking their lives to fight this evil. We thank them for their heroic action. We also thank them for taking action on behalf of all us animal lovers in China who, like yourselves, never tolerate cruelty to animals and will never stop pursuing the virtue of love and respect for all life forms on our beautiful, but often ugly, planet. 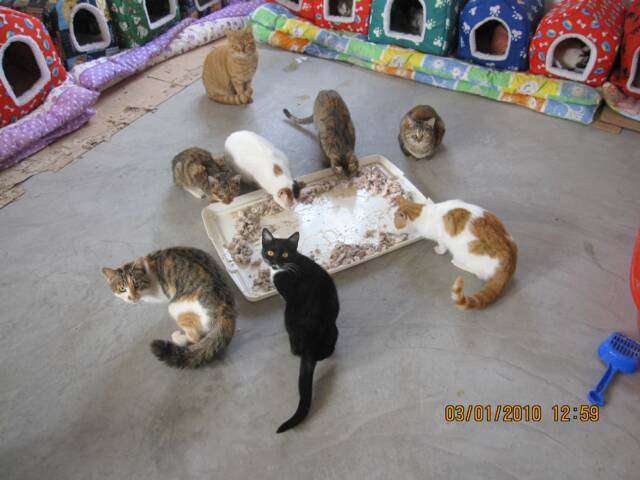 Shanghai Cats' Protection Team was formed by volunteers. Among them are mostly senior and retired citizens, civil workers, freelancers, etc (mostly female). Their enemy, on the other hand, are the evil catnappers - criminal gangs who have committed such crimes in the past. Hitherto this brave team have won several victories and saved thousands of cats. However, recently the catnappers have become more and more crazy and the situation is dangerous for our activists. On Nov. 2nd 2009, the insane criminals even attacked the cat lovers violently in front of the the police! However, their violence and intimidation can never stop our brave animal lovers. What drives these caring people that makes them so strong and fearless? Love, compassion, and the power of good prevailing over evil. I ask you with all my heart to support this loving rescuer team. They have risked their lives to save more than 700 cats from these evil criminals. 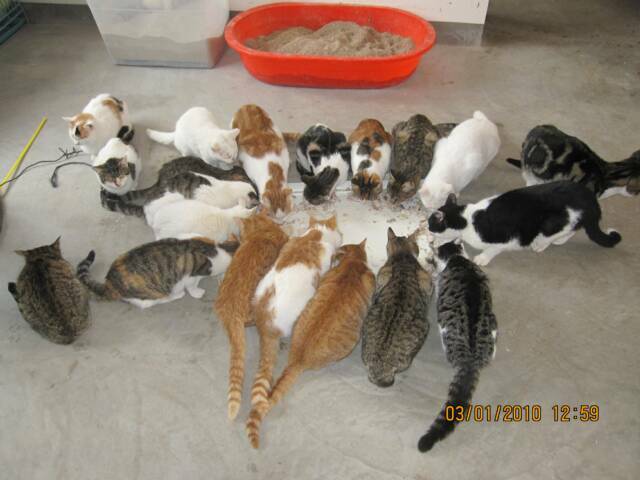 These poor cats need to be settled down into a safe place, spayed, healed, and then adopted. All this requires a great deal of money, time and effort. They are desperately in need of your help. As you know, the Shanghai Cats' Protection Team is the No.1 group who take this action to fight cruelty to cats. Their rescuer action is significant. Please, if you can, give them a hand. Your donation will be a great help to the loving cats, and above all it will help make a change to the animal rights movement in China. Because Paypal will no longer work with charity institutions (among others) in China, donations will now be routed through The Anti-Fur Society of the Misha Foundation. Our donations are always sent via Western Union. I also sincerely ask for your help in some way to stop this unbelievable cruelty. I ask you especially for your help in writing to your local media and to your government (at a high level) to implore them to urge the Chinese government to pass legislation for animal protection, especially to make the killing of dogs and cats for food (and fur) illegal. We are hoping that your support and publicity could help end this cruelty to our beloved Chinese cats and dogs. We allow you --and even beg you-- to publish this article everywhere on the Internet, in the print media or anywhere else, so that this message can be spread worldwide. QUESTIONS & ANSWERS from an animal loving person in China. 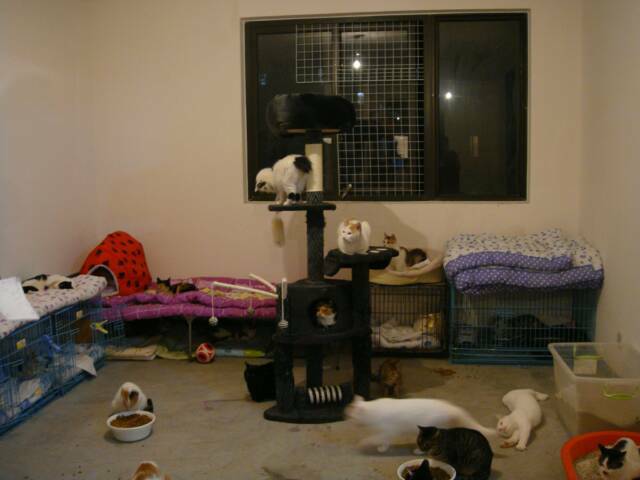 Thank-you very much for your help to our cat rescue campaign in China. I love animals especially cats, so it is heartbreaking for me to learn the cruelty to cats in my province. I have been trying with my every effort to do something to end it. Your support is very important for us not only financially but also spiritually. Since we are not able to use Internet access to many international websites, we are blocked from the outside world. Thanks to our loving friend Joy's dedication on helping us with lots of translations and correspondence, these messages about our cat rescues can spread out to good people outside China. Q: Is it a tradition or culture for Chinese to eat cats and dogs? A: No. It is nothing to do with culture and tradition. Even in Guangdong Province, surveys have shown that most people are against eating cats. Q: Why do you just rescue cats and not cows, pigs and other animals? A: Firstly, because cats are companion animals and always live near or in human homes. More and more families in China keep cats or dogs and treat them like family members. People care about these animals. If someone does not have a compassion animal close to them, it is unlikely he will feel any concern about other animals. Secondly, the cats get tortured, hung, battered and thrown live into boiling water, and they are stolen pets leaving owners and carers are so heart-broken. No-one would keep cats to have them slaughtered. People who eat cats are heartless and blood-thirsty, without any mercy to animals or people ! Q: Why single out Guangdong province? A: Guangdong is the main area where these horrible cruelties on cats happen. Cats are stolen from all around the country and shipped to Guangdong. It is the sole place in the country where some people eat cats. The local government seem to be indifferent; they take no notice of people's protests. Q: Do people eat cats because they are too poor to buy food? A: No, this is not the case. Totally the opposite is true because people only eat cats in restaurants. People in Guangdong province are relatively rich, as there has been a dramatic growth of economy in recent decades, owing to exportation to Europe and America. Some greedy people don't care about anyone, and when they get rich, they indulgent in eating whatever the restaurants say is good. The restaurants invent that cat-meat is good as they get it very cheap because the cats were stolen. These restaurants are disgusting to any caring person. Many cats, dogs, and many wildlife get caught and killed every day to supply these evil restaurants and their heartless clients. We must call for people from inside and outside China to raise their voices against this brutal and barbaric practice. A: Please help by writing to your national media, Chinese embassy and your caring friends and contacts. As China now has a close connection to the western world especially on global trading. If enough people speak out about their feelings and protest about this cruelty, the Chinese government will have to take it seriously. We call for people from inside and outside China to speak up against this brutal and barbaric practice. 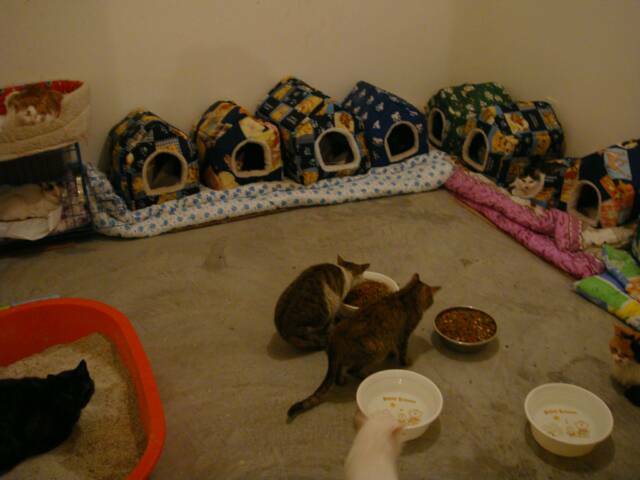 Some of the rescued cats now. Click on the thumbnail for full pic.